“Rottingdean School” – as more often than not simply called back then – was certainly a happy community, with bright, well-aired buildings, set in beautiful, extensive grounds. This photograph was taken in the Assembly Hall in June or early July, 1978, after a presentation had been made for the Rev’d Ivor Waters, Vicar of St. Margaret’s, upon his retirement. He is pictured with his wife. Mr. Lawrence, Headmaster, is pictured on the left;I am standing at the front ahead of him. A small section of the Noah’s Ark mural can be seen. I consider myself fortunate – along with many others, no doubt – to have attended this school. I write with renewed thanks and appreciation. 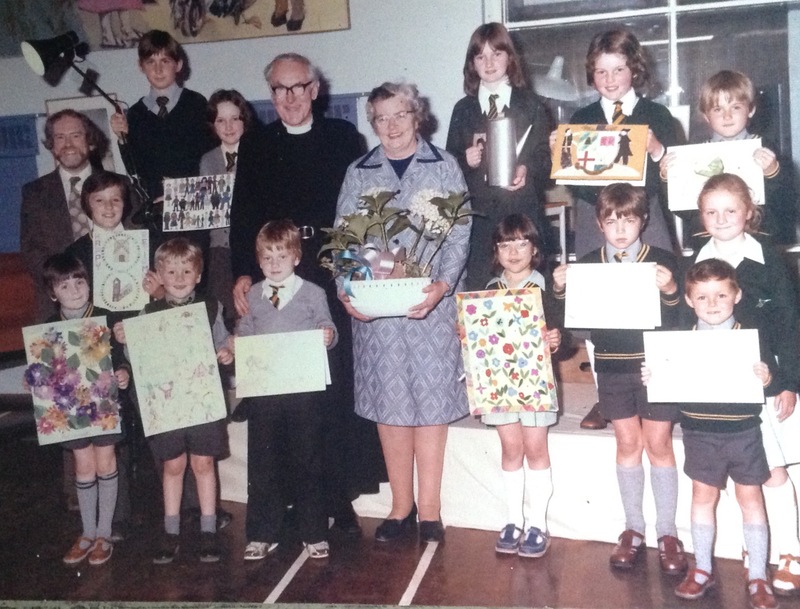 Mrs. Alston (Juniors) ; Mr. Bell (Juniors) ; Mrs. Charman (Playground Supervisor) ; Miss Clarke (Infants) ; Miss Crosland (Infants) ; Miss Hilton (Deputy Head) ; Mrs. Killick (Infants) ; Mr. Lawrence (Headmaster) ; Mr. Ludlam (Juniors) ; Mrs. May (Music) ; Mrs. Packer (French) ; Mrs. Pickles (Drama) ; Mr. Pigott (Juniors) ; Mrs. Rook (Juniors) ; Mrs. Slaughter (Juniors) ; Mrs. Sweetman (Playground Supervisor) ; Mrs. Tempest (Music) ; Mrs. Townsend (School Secretary). Also worthy of mention is “Lollypop Lady” Barbara.